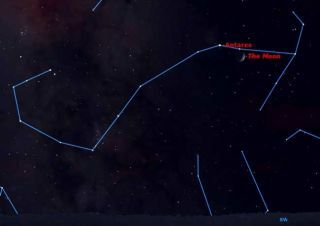 The moon often visits the bright red star Antares in Scorpius. In its 29.5-day-long journey around the Earth, the moonpasses in front of all of the planets but relatively few stars that are brightenough to be visible close to the moon. The two brightest stars are Regulus inLeo and Antares in Scorpius. Wednesday night, Sept. 23, the 5-day-old moon willbe close to Antares. Antares is Greek for ?opposite Mars,? referring to its deepred color, resembling Mars. At? present Antares is close to minimum brightness,which also means that it is at its reddest. The problem with this conjunction between the moon andAntares is that Antares is rapidly disappearing into the sunset, so that thetrick is to observe it before it gets too low in the sky. Because the moon is moving from right to left across thesky as the Earth?s rotation carries the stars from left to right, the distancebetween the moon and Antares gets smaller the farther west you are in NorthAmerica. On the east coast, let?s say Boston, at 8 p.m. E.D.T., the moon andAntares are 3? 50? apart. On the west coast, in Seattle, at 8 p.m. P.D.T. ,they are only 2? 10? apart. What happens further west, out over the Pacific Ocean? Themoon actually passes in front of Antares, in what is called an occultation.Such occultations of bright stars are relatively rare, and to see themstargazers must be at the right place at the right time. Often the moon passesjust above or just below a star, and often occultations happen on the ?wrong?side of the Earth. A conjunction between the Moon and a bright star or planetis something which requires no optical aid. It can be enhanced with ordinarybinoculars, but these aren?t necessary. So, step outside Wednesday eveningaround 8 p.m. your local time and look to the southwest. Thisarticle was provided to SPACE.com by Starry Night Education, theleader in space science curriculum solutions.